It seems several figures in the UFO community who have been very vocal about the so-called "Roswell Slides" are claiming that their email accounts have been hacked by a certain "Three-Letter Agency." Way to cover up that UFO crash, Three-Letter Agency. This news does two things: first, it perpetuates the age-old "government cover-up" meme that the conspiracy buffs cling to so desperately, but second, it bestows some semblance of authenticity to the slides themselves and thus legitimizes the efforts of the "Roswell Dream Team" to keep their narrative alive. And, it should be pointed out, it does so just as the Slides are in danger of slipping off the radar screen and being relegated to the mountainous scrap heap of useless and forgotten Roswell "evidence." So the question you have to ask -- well, you don't have to ask it because I'm about to -- you're welcome.... The question I will now ask is: if that certain Three-Letter Agency was trying to discredit the Slides and foul up the efforts of those promoting the Slides, why would they be taking actions that only serve to draw attention to the Slides? It makes no sense. You can go back a step further and ask -- and, again, I am about to ask for you: If the Slides are legit, why didn't that certain Three-Letter Agency find them and take custody of them before the cleaning lady found them in the attic? They've only had since 1947 to track them down... For a certain Three-Letter Agency that's supposed to be so clever and diabolical, they sure screwed that one up. Methinks that the only Three-Letter Agency at work here is endlessly inventive and self-serving "RDT." Airbus has filed a new patent for a UFO-like airplane that looks like something right out of a Sci Fi movie. 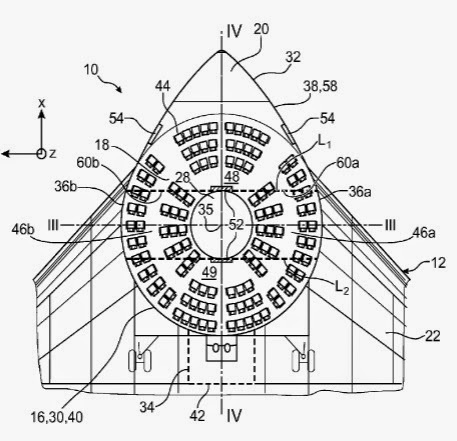 RT today described the radical Airbus design as a “bagel plane” where passengers sit in a ring. The Financial Times, which was the first to announce the new design in a November 16 story, reported that the UFO-like shape addresses key structural problems faced by aircraft engineers for cylindrical designs. Will the new Airbus design use a traditional propulsion system such as aviation fuel that is currently the standard for civilian aircraft? The UFO-like design makes more sense if Airbus was preparing for an innovative future propulsion system for the aviation industry – antigravity! 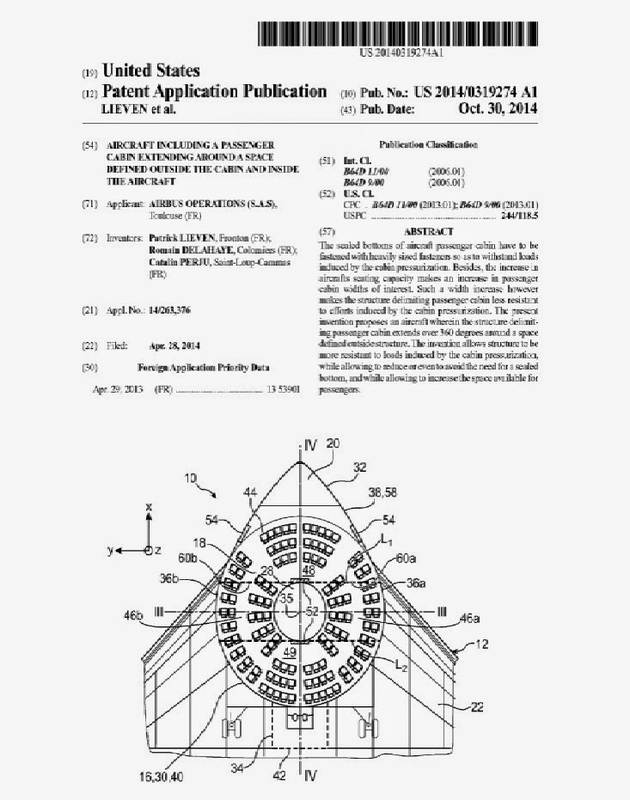 The article, appearing in yesterday's Examiner.com, includes a reproduction of the U.S. Patent Application submitted by Airbus Operations of Toulouse, France. The basic idea of the "bagel plane" is that passengers sit in a circle around a central hub, from which, presumably, the flight attendants can keep a better eye on them. Most exciting is the news that the bagel plane will be propelled by an anti-gravity drive, although I do question why the French get to be the first to use this new technology. Anyway, it seems to be a done deal, so we'd better get used to calling it "anti-gravité." As I was reading about the anti-gravité bagelship, I realized with a shock that I had seen this schematic before. In fact, I had just seen it only a couple weeks ago, when I was writing about The Gobbler, the saucer-shaped restaurant near here that I believe is being converted even now into a Space Ark... Look at the frame grab below, taken from the local newscast and showing the proposed renovations to The Gobbler's floorplan, and tell me it's not the same exact flipping thing! 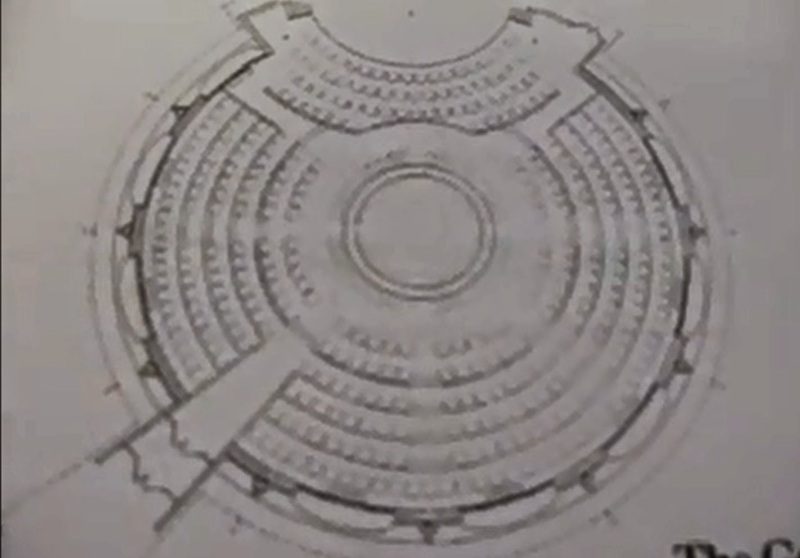 Seating schematic for The Gobbler. Or should I say 'Le Gobbler'? A few days ago I came across another oddity: an aquatic UFO case that Hynek investigated in the early 1970s, when he was in New Zealand. I'm still working on figuring out the extent to which Hynek investigated the case, but in the process I've been having an entertaining email exchange with Lxxx, the woman who was one of the main witnesses to the event, and it's a great story. Claiming that her memory was not as good as it used to be, Lxxx directed me to Carl Feindt's Water UFO website, which is probably old hat to many of you but was a first to me. There are enough water UFO's to warrant a website and a "Research Endeavor?" News to me. Lxxx heard a strange beeping and asked her boyfriend what is was. Looking around for the source of the beep, they both noticed something odd 25 to 30 yards out on the water, out behind a tourist boat and a moored seaplane... It was a circular, domed saucer in -- or on -- the water. The report didn't say explicitly what she and her boyfriend were doing in their car on the lakeshore at 1:45 a.m., and I don't want to make any assumptions, but both witnesses did report having to roll down the car window to see what was going on out on the water... Draw your own conclusions. 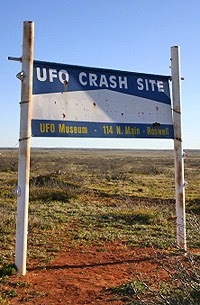 Rxxxxx reported later in the "CAPR Bulletin" that the object "appeared to be an inverted plate with a small dome on the top. The dome was dark grey, and the base of the saucer appeared to be light-grey to white in colour. There was a fog around the base of the object, therefore I couldn't tell if it was floating or hovering. Set off-centre on the dome there was a bright red light which rotated clockwise, and seemed most intense when pointed towards the car, at the same time as the light pointed towards the car, a metallic sounding "beep" rang out, the frequency of both the light and the beep was about once per second." Lxxx's report echoes Rxxxxx's in minute detail: "To my surprise I saw a huge dome or half of a saucer shaped object which appeared to be sitting of hovering in between the float plane and a small boat anchored on the lake. I couldn't judge what size it was but it was very large and seemed to be a whitish colour. There was a fog around the base of the object. There was also a red or orange light in top (just like a traffic cops car) and it was flashing in a clockwise direction as far as I can make out and beeping at one second intervals as the light turned towards the car. This sounds quite strange I realise." After fleeing the scene, Lxxx's and Rxxxxx's curiosity got the best of them and they returned to the lakeshore some fifteen minutes after their sighting... Alas, The Thing in Lake Rotorua had vanished. Forty-three years later, Lxxx didn't have much to add: "not so sure it was unique (probably was pretty amazing at the time seeing it had landed on the lake...well slightly hovering)" she wrote to me. "I dont know if the ufo came from under the water when we heard the beeping or whether it just came from the air as it just appeared out on the lake (close) by seeing it from the side window of the car." "It sounds a bit of a comedy," she wrote, "but it's true." 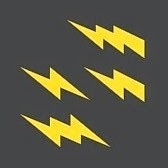 "On one occasion in the early hours of the morning (my son) and I witnessed two pinpoint lights in the sky flying about, and then a big exchange of what looked like zig-zag lightning between them. Whether they were fighting or exchanging something, remains to be seen, but it left us stunned... Then they sped off. That amazed me at the time. I thought are they exchanging information.... or fighting." Zig-zag UFOs, anyone? Are these unique to me and Lxxx? No idea what it means, but I am naturally intrigued by Lxxx's story and I hope she'll remember more details as we continue our correspondence. In the meantime, I confess to being a little confused: should we be watching the skies... or the lakes? On Wednesday afternoon, the European Space Agency made galactic history when their Rosetta Mission successful landed its Philae probe on a speeding comet, the first time such an extraordinary feat has been achieved. As with everything from the moon landing to the death of Elvis, an alternative version of “what really happened” as the Philae probe landed on comet 67P did not take long to emerge. 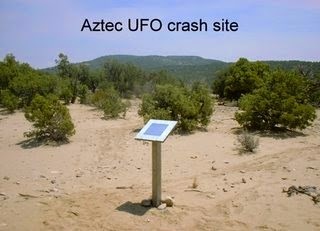 According to an email published on the website UFOSightingsDaily.com – which does a regular trade in alien sightings – this mission is part of a European Space Agency and Nasa cover-up to disguise the comet’s true alien nature. The email, allegedly from a secret whistle-blowing employee of the ESA, accuses the agency of “blatant cover-ups” in wanting to land on the speeding comet and attaches photos which claim to reveal the “true inner workings of Comet 67P”. The Philae Lander: Making "First Contact" with an alien species? The article gets stupider and stupider as it goes on, but the basic gist is that Comet 67P is some sort of alien space bouy. Because I guess the cleverest way to conduct a cover-up is to webcast it live worldwide... Hide in plain sight, as the saying goes. I know I may get some crap for this, but I've been transcribing the interview I conducted a few months back with Dr. David Jacobs, and I'm once again finding myself impressed and intrigued by some of his observations. 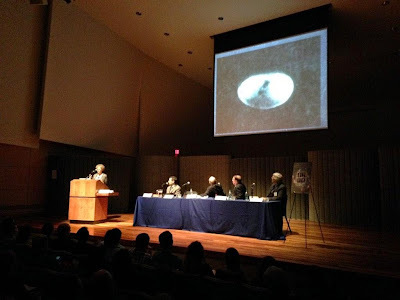 "Everything we could possibly learn about UFOs we had already learned by the mid-1970s." "Everything that has come out about UFOs since then is verification that there are UFOs. It’s extremely important: the more verification we get, the better. And people say the new thing now is triangular UFOs; there were triangular UFOs back when. The number of triangular UFOs is different… but it’s still verification, it doesn’t tell us anything." Although the volume of UFO sighting reports remains very high, he said, the level of interest in the phenomenon from the scientific and academic communities has never been lower. He then went on to list several reasons for this sad state of affairs. First, he thinks that "The UFO phenomenon is old hat," and it's hard to argue otherwise, in my opinion. UFOs haven't really put on much of a show in a long, long time. Back in the day we could always count on UFOS to buzz Washington, D.C., to lure Air Force pilots to their deaths and to abduct all sorts of people, but what have they done for us lately? Second, Jacobs thinks that the saturation of cable TV with UFO programming has, in a way, cheapened the phenomenon. "Like ghosts or angels, it’s a matter of faith and belief and not necessarily of (research)," he said. "Therefore it’s less important for science and more important for sociology." 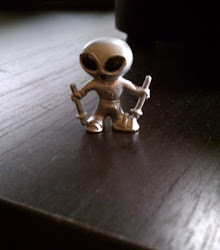 Third, he feels that UFO research has become dominated by conspiracy theories. Conspiracy theories, as compelling as they can be, are, in the end, a distraction. "As a historian of 20th Century U.S. history, I fail to find the evidence for conspiracy to be compelling," he told me. "But, you can’t prove a negative. You can’t prove there isn’t a conspiracy." Fourth, Jacobs knows from personal experience that nothing angers and alienates (no pun intended) scientists and academics like abduction cases. Surprised? I was, and I still am. Throughout the interview, Dr. Jacobs acknowledged his less-than-stellar status in the field of UFOlogy, but always in good humor. 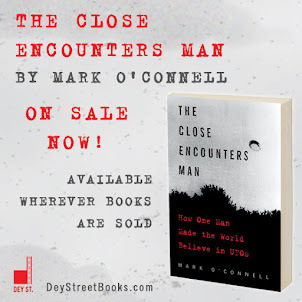 I thought he had a lot of interesting and worthwhile things to say about the state of UFO research, and I'll go into more of that in the book. For now, I'm interested to learn what readers thinks of the observations I've recounted here. Has Jacobs got it right? I think he has. What do you think?